What a fabulous show last night at the wonderful Paramount Theatre in Seattle. I knew I was in for a long night as not only was this a show that they would play music spanning their 40+ years of hits, but also be performing the album Point of No Return in its entirety. Tonight was going to be extra special as I had a meet and greet with the band prior to the show. 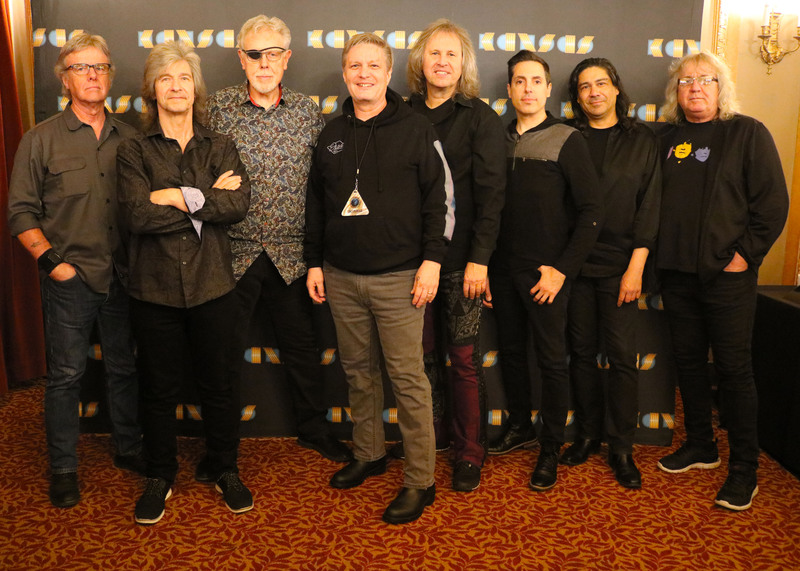 Although there are only 2 original members of the band still performing (Kerry Livgren – Drums and Rich Williams – Lead Guitar), all members of the current band were incredible. Current Lead vocalist and keyboardist, Ronnie Platt (been in the band since 2014) just tore it up. His vocals were spot on to the sound of Kansas and he brought with him just a ton of energy. Billy Greer, Bassist (who also did a lot of vocals) has been in the band since the mid ’80’s and was also awesome to hear and see. The rest of the band (7 members in total) completed an incredible lineup who all sounded and performed as you would want them to…with power and passion. With the meet and greet, we were able to meet and, very briefly talk to all the band members as we had them personalize and sign something (I had them sign my copy of Point of No Return album of course). They were very friendly and seemed to genuinely enjoy meeting the fans. They have some very passionate fans…case in point the guy who sat to my right. He was the most intense seat dancer that I have ever experienced. He violently shook the entire front row of seats all the while playing his air drums with more passion than Tommy Lee at a Motley Crue show…I mean he wasn’t playing a four piece, Ringo Starr drum set, he was playing full on Neil Peart from Rush. It is great to see someone so passionate about what was clearly his favorite band, I just wished he wasn’t sitting right next to me. The show started around 7:30, which was pretty early, but they needed to start early with all the music that that had lined up. The set list was great, starting the show with some awesome classics as well as music from their last studio album (The Prelude Implicit – 2016). Some of my favorites were of course the classics, Hold On, Song for America and People of the South Wind. Of course the entire Point of No Return album set was fantastic, with songs such as Paradox, Portrait, Hopelessly Human and of course Dust in the Wind. They closed the show out with the only song that could possibly play that could stand up for such a strong night of music and that was of course Carry On My Wayward Son. This was the best two and a Half hours of music I have heard in quite some time…thanks Kansas for all the music and memories!